Total part listing – http://goo.gl/gk3nN1 (affiliate backlink). 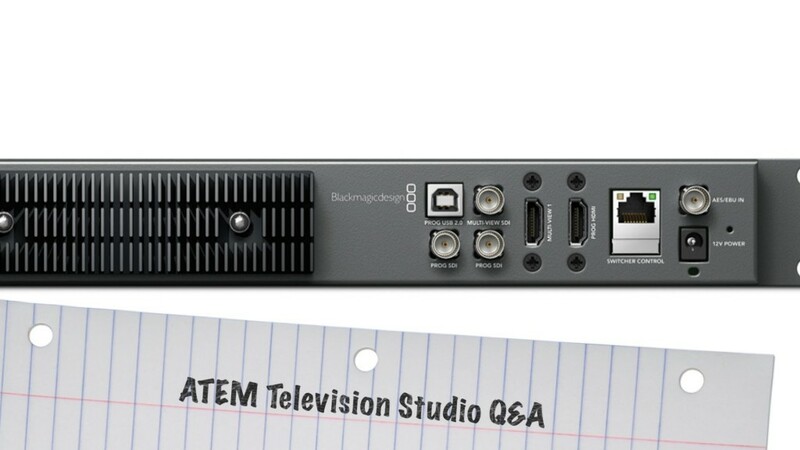 I get a lots of e-mail about the ATEM Tv Studio from BlackMagic design. Below are some responses to typical ideas– specifically the best ways to get video from the system. I information using USB recording, the Hyperdeck Shuttle bus 2, as perfectly as Thunderbolt by means of a Strength Serious. Hi Lon, Grace and peace to you from God our Father and the Lord Jesus Christ. Thanks so much for all the hard work you've been putting into these videos. They are a great help for many of us who are just starting out on live streaming + multi-cam setups. I was hoping if you can help us out with a setup that I just can't seem to figure out on how to do, and no matter how much searching I do I can't seem to find a video or article that shows how to correctly set this up. We are currently using PowerPoint to show our hymns and bible passages and would like to "periodically" show the congregation during announcements on the SAME screen that we show our hymns and bible passages. This SAME screen that shows the congregation is the exact screen being encoded by the Elgato HD 60 Pro on the same computer using PowerPoint. Our setup will have a 75" Samsung 4k TV with the same computer hooked up to it along with another monitor (standard 1080p) at the office. This computer will also be hooked up to one camera that will show the congregation during announcements. My question is, is their a way to switch between the two programs (Elgato streaming software and PowerPoint in presentation mode) WITHOUT having to exit out of PowerPoint? Will a switcher be needed for this, if so can you recommend any video switcher that can do this at a friendly price point? Thanks so much for any help you (or anyone else) can give to us. God bless you and everyone else! Thanks. I can to use Wirecast whith USB? That bit of information was sensational, thank you and God bless you! recognized by the switcher we have…. do you have any ideas? Loved your video! Is it possible to use the same computer for the ATEM software and for live streaming? Hi I am using the ultrastudio mini recorder as a means to output from my ATEM TVS to live stream. However, once the feed gets into my mac the quality downgraded significantly. I have a few assumptions as to why this may be happening, but I was wondering if you could tell me why exactly….. Thanks. I'd love to use my ATEM Television Studio Live to stream to Facebook Live. After watching this video, I realize I'll need some kind of streaming device, but do you know if even after getting that hardware, if it would be possible to do Facebook Live using this system? Would you kindly make a video of an ISO recording setting using ATEM? Quick question. Is it possible to use a high end Windows tablet (like a Surface Pro 4) to simultaneously act as a control surface (via wifi) AND record the h.264 stream from the ATEM directly via USB? Wico Command Controller in the background! Great videos, thanks!! Does the atem works with live stream studio software, I just want to stream no recording at all. I can't get media express to recognize the ATEM TV Studio as a capture device. I hooked it up USB 2.0 to my iMac. Am I missing something? hello Lon is it possible to login into a broadcasting encoder wile working? Hey I'm trying to set up a television channel can u tell me what equipment i would need to do so? Hey Lon, thank you for your in-depth reviews they're quite helpful. I have a question. I'm looking into purchasing the ATEM Production Studio 4K but unsure about a few things. I kind of have an idea but I'd like to use the switcher to edit live but meanwhile being able to go back in the editing room and change a shot for whatever reason. l know that the final recording is everything you switch during the live event and would need record the cameras separately. However, I'd like to hear your thoughts on how would one go about recording the live switching and also the raw footage ? Great content, great presentation, great use of the equipment. You are providing a great service, and influenced me to purchase the equipment. I heard that the ATEM television studio has a 2 second delay. Is that true? Hey Lon, Love your videos. Not sure if you have one on streaming over an intranet. We have the ATEM Television Studio, but the school only has computers/projectors set up in the classrooms (No TVs). So, we need to stream the broadcast over the network. What other components/applications do we need to get this done? Your videos are so helpful. My church is investing in the ATEM Television studio and I was hoping to do the controls from an iPad during live streaming. Do you still use the strata app? If so, does it still give you the same kinds of issues? Ron, youR videos are great. The time you are taking is very much appreciated. I have a question about audio. Can you explain the audio connection from your Beringer to the ATEM. Thanks in advance. I am experiencing a lot of difficulty connecting DSLR's to the ATEM Production Studio 4K (trying with a Canon 5D and a 70D); have even taken the cameras through an HDMI to SDI convertor with no success. On the other hand, I have connected a RED camera via SDI and it shows up immediately. Any insights on this? Awesome videos! I'm thinking you maybe the only person who can help me with a very specific setup I'm trying to achieve! I'm trying to put together a setup for live stream broadcasting on a CDN using some gear I already own, and some new gear to complete the setup. My questions pertain to hardware and/or software that will enable me to synchronize an HDMI video with analog stereo audio from a secondary source, into a MacBook Pro i5 for the live stream broadcast. I want to use my Canon 5DIII HDMI clean out into my Atomos 10-bit Pro Res 4:2:2 H.264 encoded Ninja 2 for recording/monitoring, and then send the Ninja's HDMI out to my Mac for live streaming on a CDN (most likely YouTube Live to start). I'd like to be able to stream video at a maximum of 1080p. Wireless is not required, as I will be using this in a home studio and not be in the field. My voice will be going through a shotgun mic into a JuicedLink RM202, then into the Ninja 2, and then out with the HDMI video signal. I imagine I could put it into a mixer of some sort (which one?) with the instrument mics if that would be better. For my guitar I want to use 2 XLR mics into my Millennia Media HV-3C preamp, then into my Apogee AD/DA, then into Logic X for processing/recording, and finally to some software, or a hardware device, to sync with the above described video stream for live broadcast on the CDN. I wont need to go over 48000kHz. I will be using my live broadcasts for musical instruction and performances, so the A/V needs to be as clear and synced as possible. I will only be using a single DSLR to begin, and I would like to keep the setup as simple as possible.